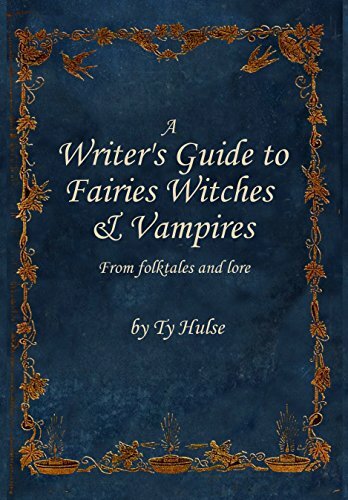 The root for the word fairy means ‘those who control death (and life);" in other words "the controllers of fate." Fairies often gave humans their fate from birth (As in "Sleeping Beauty). In ancient times fate wasn't an abstract concept, the fate which controlled all humans, whether good or bad, was what the fairies made it to be. by little girls and derided by everyone else as too surgery. They can be fearsome and dangerous beings. 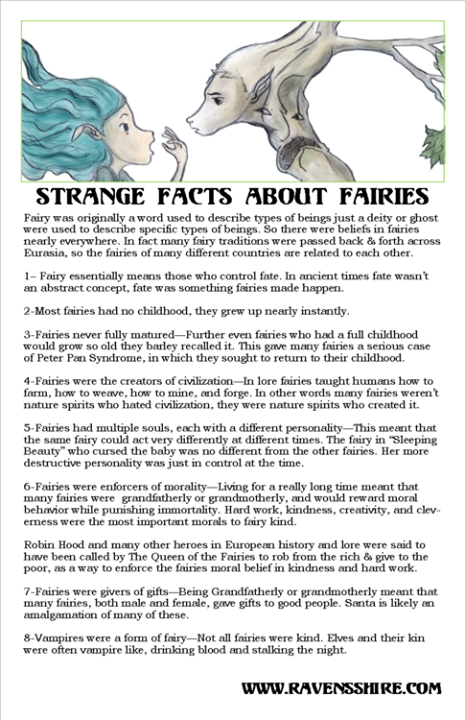 Because Fairy was originally a term to describe a type of being, just as deity is one can see many related “fairy traditions” from around the world, including the Kami of Japan, the Rusalka of Russia, and more. Many of these beliefs are even interrelated. After all ancient peoples moved around and so their stories and beliefs spread. So even the Altaic People's Northern Asia and Japan and the Indo-Europeans in India have ancient connections with each other and with fairy beliefs of Europe. The word "temple" originally meant wood (forest, trees, etc). People in Northern Europe once thought that deities lived in natural objects and it was offensive to build temples to them. Even in Rome they didn't build temples for centuries but prayed instead to trees and fire. Of course worship might not be a good word for the relationship as people would bargain with and even threaten to kill the fairies in order to get what they wanted. Nature fairies after all were also the ones who caused illness, in Ancient Rome people would perform rituals of civilization in order to scare nature fairies away to prevent people from getting sick. Fairies and deities could grow up in a year, or might even be born old from the very beginning. Even fairies who had a childhood could be thousands of years old and so would barely remember it. This is why many if not most fairies have a serious case of Peter Pan Syndrome and want to get their childhoods back. Humans are born from Nymphs in Greek Mythology (Who are Zeus's Aunts). In Celtic Mythology Humans are the children of the Deity of the Underworld. Humans can have children with fairies and fairies often have children with humans. In lore humans often became fairies when the died... Other times humans would turn into fairies without dying, simply by eating fairy food or traveling into fairyland. More than this some fairies would on occasion become human if they eat human food for too long. Tree fairies could live on in the boards made from their tree. These fairies would at times haunt houses, in one Norse folk tale the spirit of an elder tree haunted the room of two children. Fairies from Ireland to Pakistan were angered if a house was built in their paths and would cause trouble for the people in those houses, much as poltergeists are supposed to..
Rock fairies became poltergeists if they saw a human get murdered as they were sensitive to violence, so sometimes what we think of as the spirit of an angry murdered person might really be angry rock spirits. Many of the things we think of as ghosts people once thought were fairies. Of course it's also true that humans could become fairies when we died. Humans who died at sunset might become fairies, caught forever between living and dead. Other humans who died in childbirth, before they were given a name, or other important periods of transition would also become fairies. Fairies in general almost always seem to be somewhere between two extremes. The Nymphs for example are trapped between lusty woman and silly childishness. Fairies Tend approach people when they are between stages of their life which is why they are often seen by teenagers. Fairies often give advice in rhymes or incomplete gifts because they don't like destinations they like Journeys. Because fairies can see the future they know who they'll love before they even meet them. This is why they'll kidnap people to marry them or children to raise, because although they've never met they know who they are 'destined' to be with. Many fairies preferred humans and cities over nature. Banshees and their ilk would help keep specific families safe, brownies would live in homes, grants would protect cities, while nymphs were the founders of cities. Indeed people once believed that it was certain fairies who'd taught humans how to overcome the wilderness. Further the reason a vampire can't enter a house unless they are invited is because the household fairy won't let them. The reason that many evil beings couldn't cross water was because the water fairies wouldn't let them (also because water was a divider between other worlds and they couldn't leave their's). The reason we knock on wood is to awaken the wood fairy within it so that it will bring us good luck. This is just fantastic! I'm trying to think of how I can best encourage everyone to read this. Thank you!